With its spectacular rise all around the globe, Android needs no proof to showcase its ever increasing popularity and the very fact that Android users have no issues in finding any type of app that they need. You name it, it is there. The popularity of Android has grown leaps and bounds, owing to which the demand for app development has increased incredibly. With innumerable apps floating around the web, it is a challenge for service providers to cater to its varied types. But, Android has managed to create a friendship with all of them. 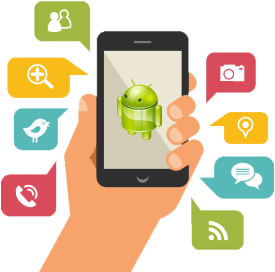 Android App Development has focussed its objective centred towards the end clientâ€™s needs and requirements. No doubt, with such a lot of demand cropping in from each nook and corner, it is a significant step to ensure perfectly stable and robust Android App Development, ensuring complete security and scalability to the end clients offering them enhanced satisfaction and finest experience. Scanning across all the major areas around app development like design, UI / UX, performance, security, compatibility, testing, implementation and installation, let us glance through some of the best possible tips and tricks to ensure a comprehensive and successful Android App Development framework. Whatsoever may be the case, end users value time the most today. And hence, it is imperative to create a flawless first impression when the user interacts with the app for the first time. The quicker and swifter the app is, the better impression it creates in the minds of the end user thereby, creating a larger confidence about that app in the eyes of the customer. No more exhaustive forms to be filled in, no more wait time to be registered or download a trial run. Act promptly with full efficiency and you will see your prospects turn into end clients. Stick to Essentials. Donâ€™t go Overboard on Information. Somehow, as app developers, we may feel elated to provide all the possible information that we have, to our clients â€“ prospective as well as actual. But, that is sometimes, not what they look for. They are looking for the concise and relatively significant information, rather than everything under the sun. Hence, stay connected with the basic requisite information and it surely will attract more customers. In case of alarms and notifications, provide only those which are indeed, an essential element. However much you ensure the best of logic, stability and robustness, the look and feel is equally important. The visual appeal and the UI / UX design is the key ingredient to attract more number of users and also attain customer loyalty. In case of a lucid and seamless flow of entities, the chances of garnering more attention increases tremendously but in case of a disturbing and unattractive interface, it is highly doubtful any end user would even attempt to proceed further. Well stated by Android – â€˜Android Studio is now the official IDE for Androidâ€™, it has turned out to be a booster to Android App Development. Because of its inbuilt Gradle based system, a nine patch creator, preview mode available for certain resources, shortcut and color keys available, Android Studio has been the hot favourite today and has enhanced the usage of Android all the more. In any app development, there are certain jobs which are to be handled at the front and some which can be easily managed at the background, in order to ensure swiftness and security both. It is better that such activities which can turn out to be lengthy should be performed in the background so that they donâ€™t eat up the userâ€™s front space and time both. Any end client would appreciate full security and privacy of their app as well as the data within it. With certain key features like using internal storage to store app files, usage of content providers, making use of SSI while connecting to the web and access / permission controls in place, Android App Development ensures enhanced security for its esteemed clientele. Make the most of Androidâ€™s very much liked feature â€“ choose whatever device you like to. That is ideally what Android App Development should ensure â€“ develop apps which can work with equal ease on any type of mobile device and not just limit to a few selected ones. Androidâ€™s density independent pixels in the layouts help you do this, with simplicity and perfectness. Something that any end user would dislike is the slow and disturbing performance of any Android app. Hence, optimizing your app to its best plays a very pivotal role in satisfying your end client. Taking care of unnecessary memory space, using most needed objects only etc. Need to be ensured while Android App Development so that the end users get the best of performance. Android App Development has been the primary backbone support to enterprises for creation and implementation of customized solutions that cater to their specific business requirements. Its popularity and acceptance has been spreading like fire and is one of the most sought after technologies today. Harness its beauty and efficiency to believe in its power and watch it perform. This entry was posted in Mobile Apps and tagged android app development best practices, android app development design, android app development framework. Bookmark the permalink. Good write up. Development work needs a more essential research which should be the first step. We need to find out what is the element an user always desires in their dream app and basing on that we should put the things in their places. We need to also take care of the UX, UI, appearances and also look that it is optimized properly. If the app is based on e-commerce then we should be very careful with the call to action which should be properly located as well the user face ease while dealing with it. From attracting the user to use the app to generate revenue from it everything should be taken care of in the whole scenario. Great article, provide really useful insight. Thanks for sharing this amazing post.